Who the hell are the 'League of Smiles'? Plus have they ever watched the TV show, 'The X Files'? And if not, why not? Would they rather dribble a lot of snot? Or just travel around for miles and miles? Yeah. That sound's reasonable. They might even bump into the great creative team of Writer: John Layman; Artists: Jason Fabok and Andy Clarke; plus Publisher: DC Comics in March 2013. Using GENERAL terms, answer the following 5 questions about this STORY entitled 'The Pursuit Of Happiness'. 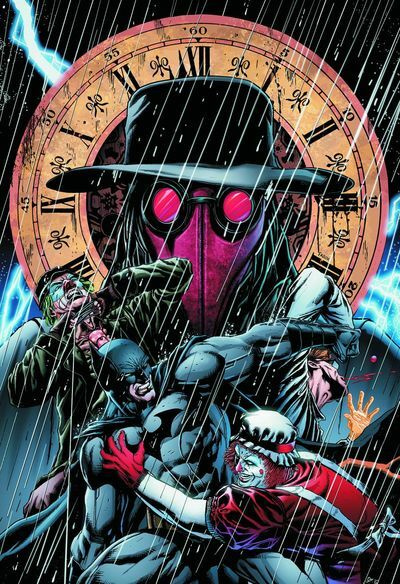 WHAT'S THE MAIN THRUST OF THIS TALE: Batman tries to find out how the deceased doctor, Byron Merideth, is connected to the League of Smiles, plus why this aforementioned 'Joker obsessed gang' is currently on a mad rampage throughout Gotham City. ARE THE MAIN OBJECTIVES ACHIEVED: Yes. After a brash encounter with one of Byron's patients -- Dane Butler -- the Dark Knight detective connects the dots and figures out that Byron and the leader of the 'LOS' -- The Merrymaker -- are one and the same person. ANYTHING ELSE HAPPEN: Batman does a mean Clint Eastwood impersonation. HOW DOES THIS STORY END: With a new day dawning for the Emperor Penguin and his crime syndicate. WHAT'S THE BACK-UP FEATURE ABOUT: At Arkham Asylum, Byron explains to the head shrink how Harleen Quinzel inspired him to do what he did. There was a moment during the penultimate confrontation between Batman and the League of Smiles, where I honestly thought to myself, that he had turned into Clint Eastwood. Here, have a read of this to see what I mean. 'You don't want to do that. I know what the Merrymaker ordered you to do. Sent you here to do. But I'm here now. I'm giving you a shot at taking down Batman. And you freaks have to ask yourself... what would the Joker do?'. Well, it's just a stones throw away from 'Do you feel lucky, punk', huh? Not that this is a bad thing of course. No way. I just love reading this type of machismo dialogue; because it does add that extra bit more character into the mix. Since John Layman has taken over this title, I much confess, I've really enjoyed the way that he's transformed it into a detective style book. Granted, here and there he's also added a bit of genre slanted pathos and frivolity into the proceedings. But by in large he's made each tale an episodic journey of mystery and action, which is just a delight to follow. Good on you, John. Please keep on trucking. My one small gripe with this issue would have to be that the back-up feature never really told us anything new, except that both Harley Quinn inadvertently inspired Byron to do what he eventually did. Come on. Face facts. Couldn't this 'reveal' have been relayed in the main thrust of the tale? Did it have to be relegated to this 'supplementary' section? Please note: this is only a very small gripe. And the art by Andy Clarke more than made up for this plot-riddled pitfall. I thought it rather original when Batman appeared as a hologram to Gordon and Bullock, and spoke to them both whilst they were inspecting dead bodies in the morgue. In fact, this is such an innovative idea, I expect to see it pop up on an up and coming episode of CSI, ha! 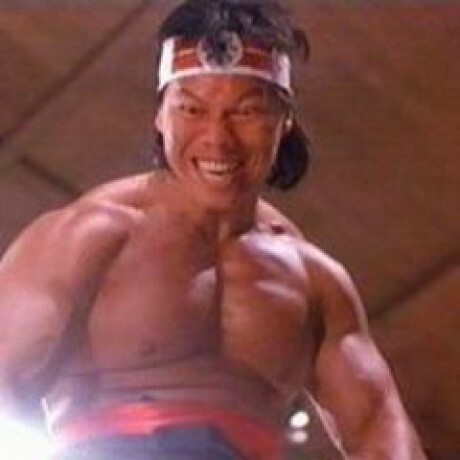 BOLO YUEN AS DANE BUTLER: Now as soon as I clapped my eyes on this muscle bound brute in a dress, I thought to myself 'Oh dear! He looks like an effeminate version of that bone crusher from the martial arts extravaganza Enter the Dragon'. Say no more. JON BENN AS BYRON MERIDETH: Although technically speaking Jon isn't an action-star per-say, in the same breath, he still played a reasonably decent bad-guy in the Bruce Lee flick, 'The Way of The Dragon'. 'DECEPTION' BY BLACKALICIOUS: From my own perceptive this story and this song both have a number of common threads running through them. Firstly: they're urban. Secondly: they're about deception and masquerades. And thirdly: they share a bold and brash vibe that's very easy to sit back and relax to. Overall this issue of 'Detective Comics' was a pretty decent read. It was entertaining as a concluding part of a story, and I thought that the artwork and the tone of this tale was a treat to peruse. However, whilst saying that, why did it have to be connected to the current 'Death of the Family' story-line? I personally didn't see any direct linkage to it myself. And I'm sure it couldn't have been explained away with a tweak to the plot here and there. Furthermore, I am wondering if this 'inclusion' is a way of bolstering sales on this title because it has dipped in recent months. Or is something else going on editorially, compelling the Bat-Books to be linked uniformly like the Superman titles were during the late nineties? Hmmm? Food for thought, dear reader. Just food for thought. GIVE IT, IT'S DUES: If This Comic Book Was a Fruit, It Would Be a Watermelon. Refreshing, Sweet, And Has a Disposable Crust.